About as useful as a chocolate chisel in a diamond mine: Might not be able to carve out any diamonds, but might renew some energy for a while. 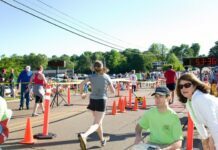 February is one of those months in the Mid South usually experienced as a looping series of fuzzy gray days wrapped in up-and-down temperatures. Dreary could be the one-word description for this time that falls betwixt and between our annual cycle of deadlines and commemorations. But beneath the truncated surface of this shortest month of the year shine riches reflective of Americans’ wit and ingenuity. Every day in February, it’s Black History Month. This historian, for one, loves learning about African Americans’ significant contributions to our nation since its beginnings four hundred years ago. It’s also Youth Leadership Month. February kicks off with Groundhog Day and launches into Super Bowl Day, and vice versa — sometimes one event occurring first, sometimes the other. Our shortest month also honors Americans’ love of all things edible. In February, we have National Homemade Soup Day, National Carrot Cake Day, National Tortellini Day, National Cherry Pie Day, National Toast Day, National Pistachio Day, National Chili Day, National Margarita Day, National Tortilla Chip Day, National Cabbage Day, National Gumdrop Day and National Almond Day. There are more… such as National Dog Biscuit Day. Some sly calendar wags also snuck in National Clean Out Your Computer Day. And of course, we have Presidents’ Day commemorating Abraham Lincoln and George Washington. In 2017, we even have Mardi Gras and Ash Wednesday in February to launch the high holy days of Christianity. But, face it. Valentine’s Day is what comes to mind when someone utters the word February. It’s our official commercial commemoration of Big Love, rooted in the ancient Roman festival of Lupercalia (a fertility celebration) and redefined by Pope Gelasius around 496 ACE as a Christian feast day commemorating St. Valentine. The Roman original stuck, however; and throughout the western world, on February 14, folks are encouraged to shower their loved ones with hearts and flowers and diamonds (known by the Lorelei’s of the world as a girl’s best friend) and boxes of chocolate. LOL… Like Joan Rivers, no smart dame will ever turn down a diamond. But a guy can NEVER go wrong plying his girl with chocolate, which has its own New World history connection to celebrations of fertility. Heck. Montezuma started it all, consuming chocolate daily for stamina. And it’s been proven in one of those recent studies somewhere, that chocolate is good for us. Women have known that since first discovering that a box of chocolates helps dull the pain of getting dumped. Must be the dopamine—serotonin thing. That’s why this week’s featured recipe is for chocolate fondue… otherwise known as dipping chocolate. 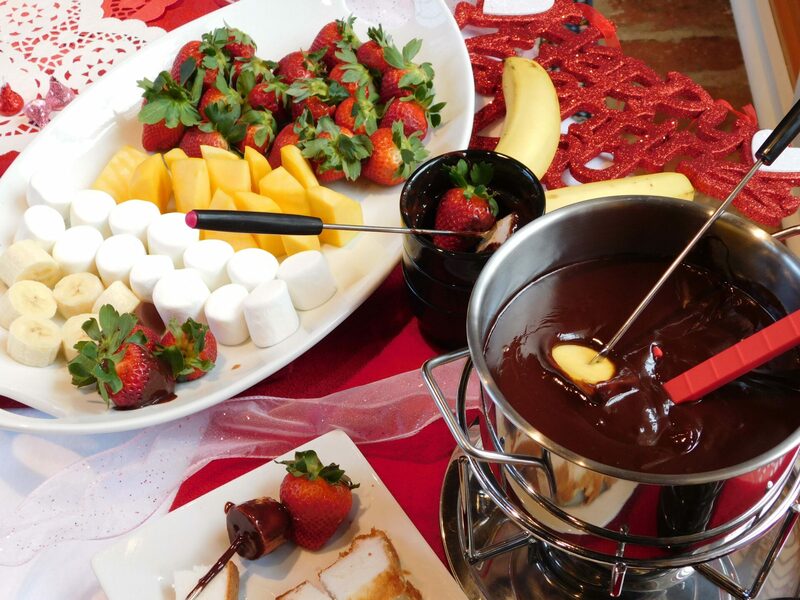 Make a Valentine’s Day party around your pot of chocolate, or use it as an excuse to celebrate any day of the week. This recipe makes a type of dipping ganache. It is forgiving as long as the chocolate is melted properly and not overheated. For example, running short of cream, I added evaporated milk to make up the full measurement. If adding flavored liqueur, add more chocolate. 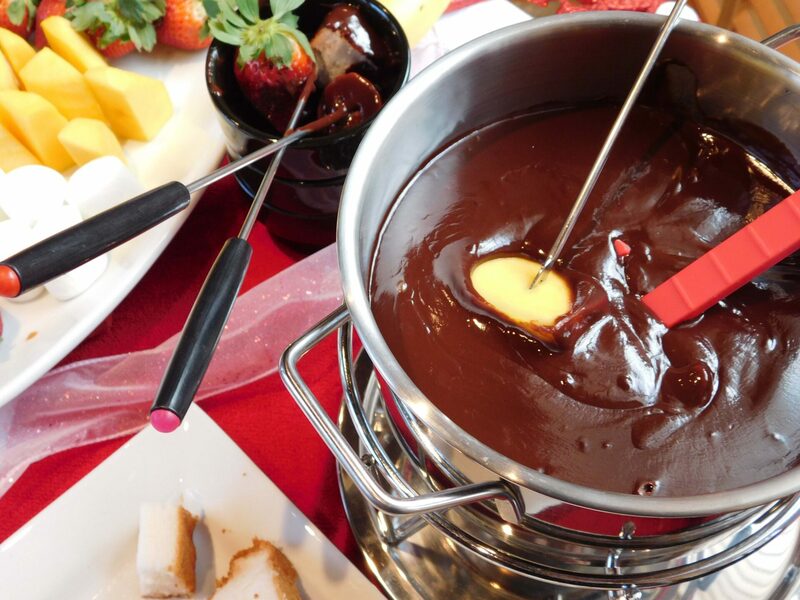 If you don’t have a fondue pot, pull out the ol’ slow cooker and place a pyrex bowl inside for the chocolate fondue. The chocolate will remain soft. Put enough water into saucepan to come just below the insert bowl (should not touch the bowl). Bring water to a slow boil on medium heat. While water is heating, arrange fruit, marshmallows and cake cubes on a platter. Pour cream into double boiler and heat until cream is hot to the touch and just beginning to form a skim on top. (DO NOT BOIL). Fold in chocolate pieces, stirring with a silicon spatula until mixture is smooth without any small lumps. Whisk in the vanilla and optional liqueur. Pour mixture into the fondue pot and keep the burner flame on low heat to avoid scorching. Dip goodies into the melted chocolate. Store leftover chocolate dip in the fridge, covered. My daughter has an allergy to Red Dye #40, so the old Waldorf Astoria Beet Red Velvet Cake recipe has been in my baking repertoire for more than 25 years. This particular recipe is a flourless variant substituting agave syrup for sugar, and deleting the buttermilk. The result is almost pudding-like and the cake layers short, but flavorful, especially when paired with traditional cream cheese frosting. This recipe perfectly fills my set of five 6-inch heart-shaped torte pans, or will fill a single round springform pan. NOTE: if like me, you have a disaster removing one cake pan from the oven, just crumble the wrecked cake layer and pat crumbs around the edges of the torte. Select two bunches of medium-sized beets, averaging about 3 beets per bunch. Peel the beets, mindful that the juice will stain skin, countertops and fabric. Reserve beet greens for sautéing for another meal. Steam the beets until fork tender, about 30 minutes. Turn off heat and let them cool down in the pot, covered. Preheat oven to 400˚F. Lightly grease torte pans or springform pan with shortening. If using springform pan, also line with parchment paper and grease the paper as well. Puree cooked beets until about the consistency of baby food and measure 7 generous ounces into a large nonreactive mixing bowl. Mix in the softened butter, agave, cocoa powder and salt. When completely blended, mix in the eggs and vanilla. The batter will be thin. Ladle even amounts into each torte pan. Bake about 20 minutes, until center is springy. Remove to racks to cool and carefully flip out onto separate sheets of waxed paper. These cakes will tear easily. Make the cream cheese frosting by mixing cream cheese and butter until smooth. Add vanilla until blended and slowly mix in powdered sugar and milk until smooth. There is enough frosting to completely frost sides of a four-layer torte, or top only of a five-layer torte. When ready to build the torte, place one cake layer on plate and gently spread frosting about 1/4-inch thick over the top. Carefully flip second cake layer onto the frosted top, using the wax paper to position it. 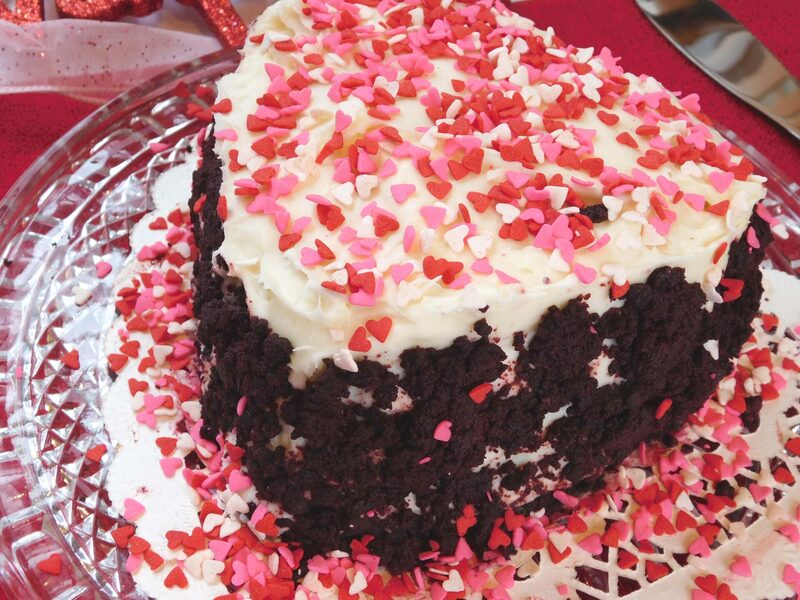 Repeat frosting and layering until all layers have been added. Decorate top with sprinkles of choice. Refrigerate overnight to set and so that chocolate flavor will intensify.